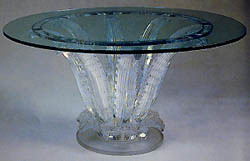 Rene was not the only talent in the Lalique family. 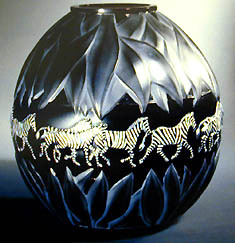 His daughter designed glass for Lalique in the late 1920s as well as designing porcelain for Sevres. 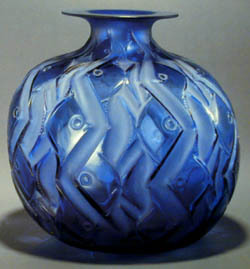 Marc Lalique’s Rene’s son took over Lalique after Rene’s death in 1945 his best known designs are the Cactus Table, Swans and Air du Temps perfume bottle first produced for Nina Ricci in 1947. Marie-Claude Lalique Marc’s daughter is the current head of Lalique and has supplemented the line of lalique models from old molds with her own colorful and very creative designs in full lead crystal, Rene used demi-crystal about 12% lead.